It’s the thing your Grandma makes from scratch for those lazy sunday afternoons. And because she’s Grandma she will top it with ice cream. Or in may case, my aunt. There always seemed to be peach cobbler in her house during the summer. She made it from canned peaches and most likely with cake mix, but I can literally taste it just thinking about it. I never tasted fresh cobbler until I was an adult. In the south people tend to use what is easy and make it special. And it works. Somehow they take mediocre ingredients and make them sing. They make them into things you miss when you grow up, tastes you crave when you are away from home. Then as an adult I discovered food blogs and baking without using prepackaged ingredients. I discovered the joy of chopping my own apple for cobbler, and making my own cake mix from scratch. When I moved to Africa, a whole new world opened up. I now walk up to the man that sells solely fruit and buy cherries and peaches from him. Personally. He picks out the best for me. I don’t just grab them from a nameless faceless bin at the supermarket. I’m not sure I will ever lose the thrill of buying produce at the Souk, from real people who remember me and know that I really do just want 4 peaches, and not a whole kilo. It’s the thrill of only being able to cook with what is in season. And learning that you really do want to eat peaches every other day in the summer because you will sorely miss them come December. 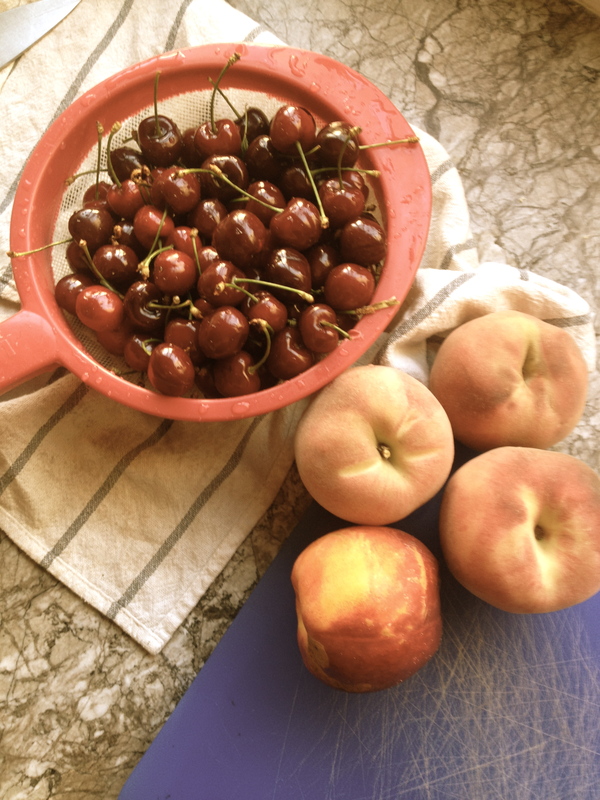 This summer my goal is to eat a ridiculous amount of peaches and cherries. Fresh, in cobblers, in muffins and any other way I can think of serving them. I intend to revel in the glory of summer fruit until they are no longer to be found at the market. Then I will slowly remember how much I love tangerines and pomegranates. But that’s still at least 3 months away, so for now PEACHES and cherries! Thus we have the Summer Cobbler. Some of the best fruits of the season, combined with a yummy cake topping. It’s the taste of pure summer. In one bite. Pure happiness and memories of being a little kid running around in the hot sun then being treated to Grandma’s cobbler. Feel free to switch cherries and peaches out with your favorite summer fruit. Blueberries, blackberries, pears, take your pick. On a side note, go out and buy yourself a cherry pitter. Your life will be easier and a lot less cherry juiced stained. Your counter tops, kitchen towel and fingers will thank you. I promise. It’s now on my mental list of things to buy- because pitting cherries by hand just takes a ridiculous amount of time, and you end up with red fingers. It’s a no-win situation. Fill baking dish with sliced peaches and cherries. Sprinkle with corn starch and heavy cream. Mix to combine and roast in the oven at 190 C/ 375 F for approximately 15 mins. In the meantime, mix milk, egg, butter and maple flavoring and sugar together until combined. Add in flour and oats. Stir until there are not clumps left and the consistency is a little thicker than cake bater. If the mixture if too think, add a little more milk. After the fruit has roasted, remove from oven and pour cobbler batter over the top. I chose to only leave a little fruit showing, but you could leave more uncovered. Either way it will taste fantastic. Bake at 190 C/375 F for 20-25 minutes. Test your cobbler at 20 and see if it’s at the consistence you like. Some people prefer a more gooey cobbler, some more cake like. Take it out closer to the 20 minute mark for gooey, and the 25 for cake like. Serve with whipped cream or ice cream….or both. I won’t judge.